The LA food truck scene is booming, and Vietnamese food has always been a trendy yet underrated cuisine. Put the two together, and you've got the ever popular pho and banh mis on wheels for the masses. The problem is, more than one person apparently had this same idea...yet Eat Phamish is the only one who seems to get it right! I am not Vietnamese, nor do I have any Vietnamese relatives, so I can't exactly say what AUTHENTIC Vietnamese food tastes like...but what I do know is that this truck certainly has the tastiest. So to all you other banh mi trucks out there, step up your game! 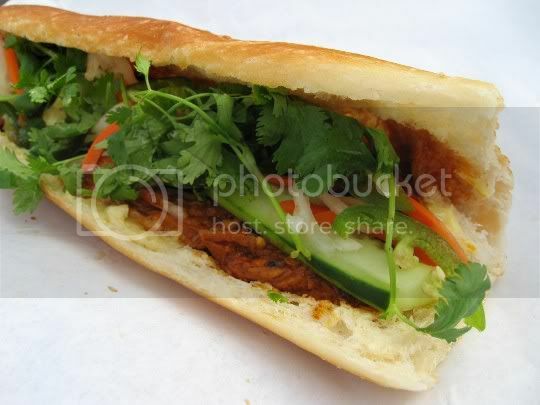 It's funny how I didn't even know what a banh mi was a year ago, and now I can't stop thinking about them. Eat Phamish's version is the best I've tasted thus far: it's the most flavorful, the best textured, and seemingly the freshest. The foot-long bread is thin, crispy, and chewy, but sturdy enough to hold the sandwich fillings. It's not too doughy and has a sort of butteriness (is that a word?) to it. The sandwich itself is chockful of fresh veggies: pickled shredded carrot and daikon, thick-cut juicy and sweet cucumber spears, spicy jalapeno slices (seeds left in, of course), and loads of cilantro. And then there's the tofu: a tad too greasy (but in a good way), chewy and chicken-like in texture, salty, savory, sweet, tangy, with hints of lemongrass. The tofu-to-veggies ratio is probably pretty low, but the tofu is so packed with flavor that you really don't need a lot of it. The bread is slathered with garlic mayo (which really helps the bread from getting soggy) and adds a great creaminess. Some spots on the sandwich were a bit overly salty; I'm guessing this is where the soy sauce was inadvertently splashed. But if you're looking for a good hearty (and cheap) meal full of salty, spicy, and sweet flavors, this is it. Follow again? Yes! Banh mis are callin' my name! 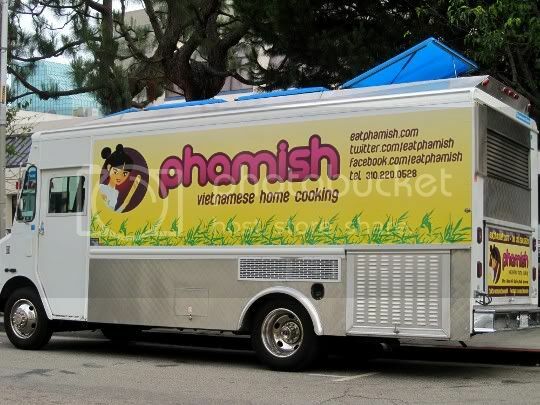 Eat Phammish has the best banh mi on wheels! When I first saw their sandwiches, I thought "I'm gonna be stuffed if i eat that thing". What a suprise! It was light, refreshing, and the perfect amount. And yes, "butteriness" is a word. Ha!